This article is a brief description and assessment of the Lowrance 500 series of instruments, focusing on the LMS-520c combination GPS receiver, electronic chart display, and SONAR. The model I had an opportunity to bench test was the LMS-520c. This is a combined GPSr, chart display, and 200-kHz SONAR. The GPSr is mounted externally and attached by constructing a NMEA-2000 network to which the GPSr receiver and the electronic display are connected. Lowrance has provided everything needed. There are enough NMEA-2000 components that you can create a network if you don't already have one. The 12-channel GPS receiver is housed in a separate enclosure, the familiar hockey-puck-size white molded assembly. In the early days of marine GPS receivers, these units were just the antenna. Then they became the entire GPS receiver. Now the unit is the antenna, the receiver, and a NMEA-2000 network node all in one. The GPS receiver is also capable of receiving differential correction signals in North American from the FAA's WAAS satellites. The LCG-3000 is mounted using the QM-1 mount. The mount incorporates a twist lock mechanism, so the device can be easily removed if desired while the fixed mount remains in place. The mount offers two options for cable routing. It does not provide for pole mounting. 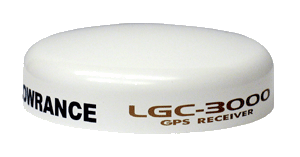 If the GPS receiver has not acquired any satellites, there is a feature in the LMS-520 that allows the user to locate the approximate current position using the built-in map cartography in order to speed up the satellite acquisition process. By giving the receiver a hint about its location it can improve its guess about the position of the various satellites that might be in view according to its stored ephemeris. That is really a good idea, and it exploits the combined facilities of the two devices. With the LCG-3000 unit sitting on the window sill, the initial satellite acquisition after taking the unit out of the box for the first time was going very slowly. I moved the receiver outdoors, giving it a better view of the sky. Satellite acquisition improved, and a fix was obtained, however without WAAS enhancement. After about 30 minutes I re-checked and WAAS corrections were being received. Judging the acquisition time is a little tricky. If the LCG-3000 is connected to the network it will be powered up and running. Thus when the LMS-520c is switched on, the GPSr will already have acquired a fix. The only time the GPSr shuts off is when power to the network is shut off. When coming up from a cold start, the receiver took a minute or two to acquire satellites and get a good position fix. Following a cold start, the unit did not progress to WAAS mode. The STATUS page showed no signal from the WAAS satellite, so I moved the LCG-3000 a couple of feet farther away from the house. This immediately improved the signal level from the WAAS satellite, and a differential position fix was obtained about a minute later. Perhaps a tree was in the way. I moved the GPSr back indoors and set it on the window sill of a west facing window. I disconnected the power from the NMEA-2000 network and let the unit sit for several hours so the LCG-3000 would re-start from a completely off condition. On re-start the unit acquired a two-dimension fix in about a minute or two. After a few minutes had elapsed the unit had a three-dimension fix. From the window sill the WAAS satellite was not acquired after an hour. However, the next day, I repeated the test and the WAAS satellite was acquired. The WAAS differential correction signal comes from a geo-stationary satellite which is in a much higher orbit than the rest of the GPS satellites. If your view to that satellite is obscured, you are not going to get the WAAS enhancement. Since my location is in latitude 42° North, a geo-stationary satellite on the equator and on my meridian would have an elevation of (90-42=) 48-degrees. If a satellite is east or west of my meridian, the elevation angle decreases. The current WAAS satellite source is from either GALAXY 15 (133°W, Pseudo Random Number 135) or ANIK F1R (107°W, Pseudo Random Number 138). ANIK F1R is closer and should be at a higher elevation for me. The STATUS display on the LMS-520c does not give the PRN for the WAAS satellite, but it does show its approximate azimuth and elevation via a graphic display. Interpreting the graphic I judged the azimuth to be approximately 240° and the elevation to be about 22°. To discover which of the satellites I was using, I then checked my look angle to both of them (using an on-line calculator). My estimate of what the display is trying to tell me is in good agreement with GALAXY 15's look angle, so I assume I am receiving my WAAS corrections from that source, PRN 135. That path is more or less directly out my window, although there are some trees which may be in the way. The signal strength indicated is about half-scale. After installing a software update, I discovered (quite accidently) that there was an additional satellite status display page available if you hit the down arrow key several times while on the main satellite status display page. 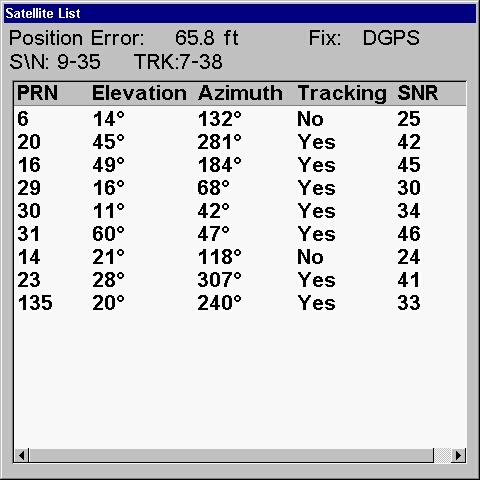 This hidden page shows the PRN, Elevation, Azimuth, Tracking Status, and Signal-to-Noise ratio of all the satellites in view. Also as a result of applying the update, the unit needed to re-establish its location and re-acquire tracking of satellites. Again this process was slow, and even after about 20 minutes the receiver did not have a good fix or know the time. As it was a warm Spring evening, I fed the antenna out the window again, and the LGC-3000 responded quickly with a 3D fix with WAAS correction. Curiously, the WAAS satellite was one of the first to be acquired. The unit seemed to always acquire its WAAS signal from PRN135, which, at my location, is not the preferred satellite. The signal from PRN138 is typically stronger and the look angle at a higher elevation. I do not think the LCG-3000 GPS receiver was making the best choice with regard to which WAAS signal it ought to track and use. During one afternoon while I had the GPSr running on the bench, the unit began to emit an occasional "beep." Upon investigating, I found that the fix had degraded to only two-dimension, even though this 2-D position was receiving WAAS correction data. Apparently due to the antenna's poor view to the east, there were not sufficient satellites in view to deliver a three-dimensional fix. "I purchased a 527 DF last spring and it has worked great for me. I didn't have any problems with it at all. "The GPSr never lost contact with the satellites except the first day out and that was only for a brief period (less than 10 seconds). I think it was maybe calibrating or something. Since that time I've never lost contact. It held my fixes fine and that was important when placing lobster pots outs--being able to fine them quickly and easily. "The screen was easy to read and navigate between functions. The clarity is fantastic and being able to increase or decrease the backlighting was very helpful. "Would I buy it again? Yes, without a doubt. It's a great unit and works very well for my needs--fishing, lobster pots and not getting lost in the fog." The LMS-520c display unit features a bright color thin film transistor (TFT) liquid crystal display (LCD) with cold cathode florescent lamp (CCFL) backlighting. The color display has 480 horizontal pixels and 480 vertical pixels, and it measures 5-inches diagonally. Lowrance has coined the name "SolarMax" to describe their display and to indicate it is visible in sunlit environments. The size of the display is probably the most significant characteristic that separates competing products into various classes of performance and expense. At 5-inches the LMS-520c display is physically small, but its pixel resolution is quite good. The display has an aspect ratio of 1:1 and its sides are 3.5-inches long. This gives a dot pitch of 137 pixels per inch, and the display correspondingly has a very fine and detailed presentation. There is no sign of gear teeth or pixillation on the display's glyphs. I did not get a chance to test the display on a boat and in sunlight. The display is quite bright and when using it indoors I found I had to reduce the brightness two steps (by tapping the power button) to set the display to more comfortable viewing. The LMS-520c includes a 200-kHz SONAR. Unlike the GPSr, the electronics for the SONAR are in the display unit, not in the transducer. Since the unit was on my bench and not on a boat, I did not actually test the SONAR. I used the simulator to gain familiarity with the presentation and controls available. Lowrance has a long history in the field of fish finders, and its units offer a lot of controls and features for adjustment of the SONAR. Lowrance does not describe this SONAR as being "digital." As for what precisely "digital" means in conjunction with a SONAR, my presumption is that to properly make a claim for this distinction the signal processing has to shift from the analogue realm to the digital, and special digital signal processors (DSP's) would be used to manipulate the returning echo signals prior to presenting them on the rasterized display. The echograms seen in the simulation look quite impressive, and it is hard to say if they'd be better in a digital sounder. A screen capture of a full screen SONAR echogram. This is from the simulation program in the unit. I don't know what lake that is, but it has a lot fish. The simulator appears to just play back a captured echogram recording. The unit provides a feature to capture and record echograms to the MMC/SD memory card, as well as the ability to play them back on the screen of the LMS-520c as it is doing here. 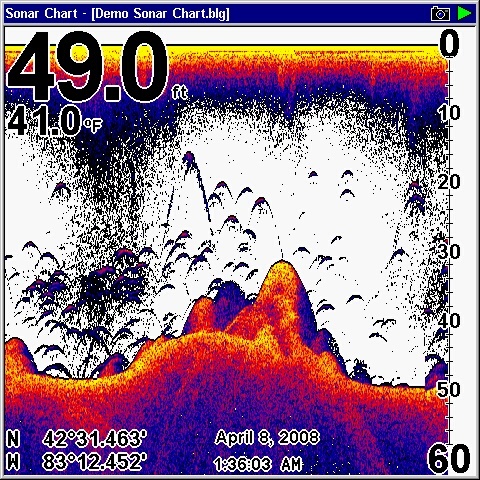 Lowrance calls these files SONAR logs. The log files can be viewed on a Windows computer which can run a binary executable file called Sonar Log Viewer. This limits these files and this recording technique to computers which can run the viewer software. Generally that means a Windows computer, but with the new Intel processor Macintosh computers, one could set up a Windows emulation which ought to be able to run the SONAR Log Viewer. I will try to test that theory in the near future. This screen capture shows the display in split screen mode with a chart and a SONAR echogram displayed. Note the camera icon in the upper right; this indicates the device is in the screen capture mode, which changes the function of the power button. The supplied transducer is a HST-WSBL wide-angle 200-kHz transducer. "Wide" refers to a 20-degree cone angle for the transducer sensitivity. A temperature sensor is also included. This transducer is not particularly large as SONAR transducers go, and it is hydrodynamic in shape in the familiar Lowrance Skimmer style. There is a long integral cable to connect to the control head. The cable uses the blue connector. In Lowrance devices the color of the connectors is used to differentiate their function and also their epoch in an ongoing evolution of connector styles. The dual-frequency transducer is significantly larger. Having previously installed and used three or four Skimmer transducers, I can attest to their ability to give good performance even when the boat is moving at high speed and to not throw a large rooster tail or create a fountain of spray. The LMS-520c arrives in a rather compact cardboard box, but it is packed with materials. (See the list below.) Initially I did not think a mounting bracket had been included, but it is skillfully integrated and hidden in the packing material to conserve space. Lowrance's adoption of the NMEA-2000 network approach has added some complexity to the interconnection of the components. Self-installers will need to carefully read the included literature. Two power connections are required, one for the display, and one for the network (which powers the LGC-3000 GPS receiver). The NMEA-2000 network components supplied use Lowrance's red connectors. In NMEA-2000 networking there have been some disputes among vendors and the standards organization about the proper connector, and previously Lowrance was using a connector of a different style and color. In c.2007 Lowrance switched to their current red connectors which are compatible with the official NMEA-2000 recommended connector. 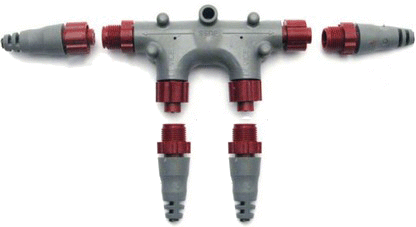 Lowrance uses a plastic connector body and threaded locking ring. Apparently there has been some field experience of problems arising from connectors being jammed together with the pins and sockets misaligned. A cautionary note is included to warn against this mistake. Lowrance color codes the connectors on the rear panel of the LMS-520c, and it would be hard to misinterpret which receptacle was intended for which color-coded cable. The power wiring is a bit odd. The display's power cable has three conductors (red, black, white) but only two are used. You are instructed to insulate the white conductor and set it aside. The network power cable also has three conductors (red, black, shield), and the instructions tell you to bond the shield to the vessel ground, which of course is generally the battery negative. If your vessel does not already have a NMEA-2000 network installed--and this is probably going to be the case for most users--you have to create a network so that you can attach the GPS receiver and the display to it. To facilitate the wiring, Lowrance includes a special two-port network access Tee. Using the supplied extension cables, you just plug the GPSr and the display into the drop cable ports of the Tee, and then attach the 120-ohm network terminators to each end of the Tee. The display includes a network power feed, and this eliminates another element in the external wiring. You've just created an instant NMEA-2000 network. The SONAR and POWER/DATA cables are easily differentiated because their genders are opposite. The connectors use a twist-lock, except for the Network connector which is threaded. The wire used by Lowrance to fabricate their cables has a rather stiff plastic insulation. The wiring was slow to relax from the set it took while bundled for shipment, and even at room temperature (68°F) the cables felt stiff. I anticipate that on a cold morning on the boat they will be very stiff. I approached operation of the LMS-520c without reading the instruction manual. I wanted to see if I could deduce the layout of controls and functions just by interacting with them. I discovered that Lowrance has included a pop-up explanation window which automatically activates when the operator hovers over a control function. This is a great feature and helps the operator become familiar with the unit. There is also a control to turn this feature off, which is probably appropriate after the operator becomes thoroughly familiar with all the functions and controls contained in the system. The unit has nine front panel controls. Eight of these are push buttons with fixed functions. The ninth control is a four-way rocker switch which is used to adjust the cursor position and to navigate in the menus structures. There are no soft keys that are tied to display legends. The relatively sparse control surface means that operation of the unit requires quite a bit of access to hierarchical menu layers of options. This style of control interface tends to require a greater number of user inputs (buttons pushed) to accomplish the desired function. An electronic chart display needs electronic cartography to be useful. The Lowrance LMS-520c includes a base map of the United States (and some of Canada). The base map is built into the unit's firmware. It is not necessary to load the data via the memory card slot; it's already there in the device's memory. 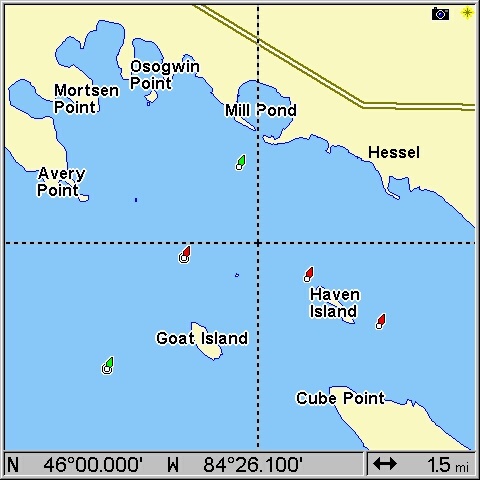 The cartography includes both highway maps and marine charts. The highway detail is quite decent, and it is sufficient to find major roads and streets. It does not include side roads. For example, it did not include any of the residential streets in my neighborhood. The highway data is more or less a bonus feature. Considering the somewhat complex wiring, the separate GPS receiver, and the necessity of building a NMEA-2000 network, I would not expect to adapt this device for use in my car. By the time I built all of the necessary accessories into my vehicle, it would be cheaper to buy a dedicated GPSr and street map unit. The marine charts included are of sufficient detail to be useable. They do not contain a great deal of hydrology, but they do show depth contour lines. I expect that most users will augment the base maps with more detailed cartography for their local waters. The base map cartography in the vicinity of Hessel, Michigan in the Les Cheneaux Islands shows the aids to navigation and some shoreline features, but no hydrology. 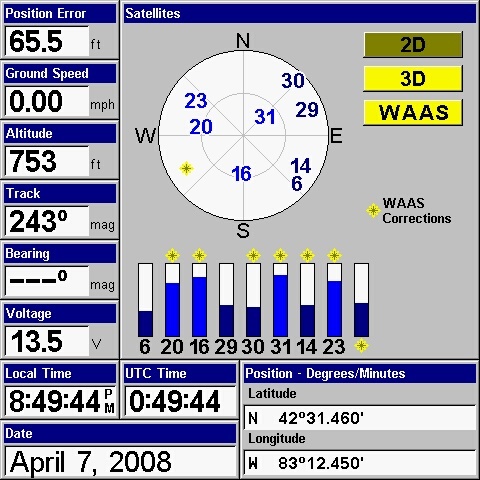 The star icon in the upper right indicates the position is a differential GPS position obtained using WAAS correction. The cross hairs are indicative of the cursor position. When the chart is showing the vessel position a small arrow icon appears without the cross hairs. Additional cartography can be added by inserting a MMC/SD memory card into the single front panel slot on the LMS-520c. You can only have one memory card mounted at a time. There are several options for adding cartography. Lowrance sells its own brand of digital cartography which is distributed on a CD-ROM and called the MapCreate™ USA Topo Accessory Pack. Using a computer running the Windows operating system, you can select segments of the data on the CD-ROM for your use. This data is then compiled into a file which is written onto a MMC/SD memory card. The card is then transferred to the LMS-520c, and the data loaded from the memory card. To use this feature you have to have a computer, the Windows OS, a memory card reader, some read/write memory media, and the time and expertise to perform all of those steps in advance of when you will need the chart data. The LMS-520c is quite flexible about digital cartography it can use. It also supports FreedomMaps™, Fishing Hot Spots® PRO, LakeMaster® ProMaps, NauticPath™, and Navionics® digital chart data. You can also insert your own MMC/SD memory card and store images, way points, and routes on it. The memory card can then be removed and mounted as a volume on a computer, giving access to the stored files. This feature was important to me because I wanted to make screen shot recordings from the SONAR, and then be able to view them on my computer. The LMS-520c came out of the box with an operating system which did not support screen capture. Lowrance has released an upgrade which adds this feature. To apply the upgrade you have to insert a memory card with the upgrade software stored on it. You can get the upgrade from Lowrance's website using a rather unique JAVA applet. The use of JAVA makes the process independent of the operating system of the computer being used. As long as you get the upgrade patch onto a memory chip, the LMS-520c does not care which computer operating system put it there. It works for Linux, MacOS, and Windows. I was able to accomplish the entire update process using my Mac OS 10.4 computer. This is a significant result. 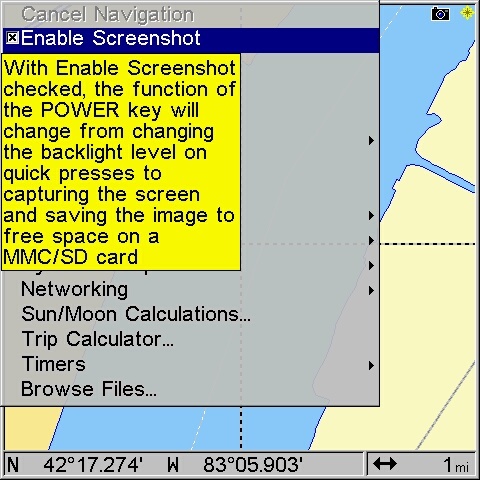 It shows that Lowrance is recognizing that not all boaters also own computers that use the Windows operating system. The update to v2.3.0 adds the screen capture feature. This screen capture shows the pop-up information which explains menu choices to help the user become acquainted with the user interface and its controls. When the LMS-520c records a screen capture, it only records a single file which is a JPEG representation of the screen image. The recorded file size is reduced from the screen image itself by virtue of the compression capability of the JPEG algorithm. If the screen image were recorded to an bit-mapped graphic--which is more likely the type of data which is actually used to draw the screen--the file size would be 480 x 480 x 8, or 230,400 bytes. Instead the JPEG files are about 50,000 to 175,000 bytes, depending on the complexity of the image. The recorded JPEG files do not contain any information that was not seen on the screen. Thus they do not contain any historical data such as the time when they were recorded or the location of the unit (from the position data) where they were recorded. Such meta-data (data about the data) would be very useful to record, perhaps in an accompanying file. Having this meta-data would relieve the operator from having to take careful notes about the screen captures. Additional data could also be captured, such as the settings used to process the SONAR signal. One way to work around the limitation of the screen capture being only the actual on-screen data might be to use the ability of the LMS-520c to customize many of the displays. In this case, we can add additional information on the screen. The position, time, and date information can be display on-screen in one of the corners of the display in a small font. The SONAR page has been customized to include time, date, and position information. I do some of my best work at this time of night. MNEA comes in two forms on the LMS-520c. There is a single NMEA-0183 serial port with input and output. There also is the innovative NMEA-2000 network connection. With NMEA-0183 you will be able to interface the LMS-520c to other devices which are NMEA-0183-only. This probably includes most all VHF marine radios except the one or two models (just coming to market) which have NMEA-2000 connections. Interconnecting the radio and the GPSr is the primary application when you have a DSC radio. The radio will need to have the vessel position data sent to it so that it can be transmitted in an emergency. A DSC radio can also receive positions from other vessels. It is not clear if the LMS-520c will respond to this type of information. With only one NMEA-0183 serial port, there may be a hardware bottleneck if you want to connect more than one device to the LMS-520c NMEA input. 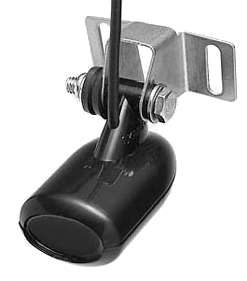 Communicating in the other direction, one NMEA-0183 sender can drive more than one listener, so the single output on the LMS-520c should not be a problem for most configurations. The LGC-3000 GPSr is a NMEA-2000 device, and it is the source of the position data. The LMS-520c must be acting as a translator or bridge. It is receiving the position data on its NMEA-2000 port, and the data is then being translated to the NMEA-0183 port on the LMS-520c. With NMEA-2000 networking, only a single port is needed. All devices connect to and communicate on this common backbone. 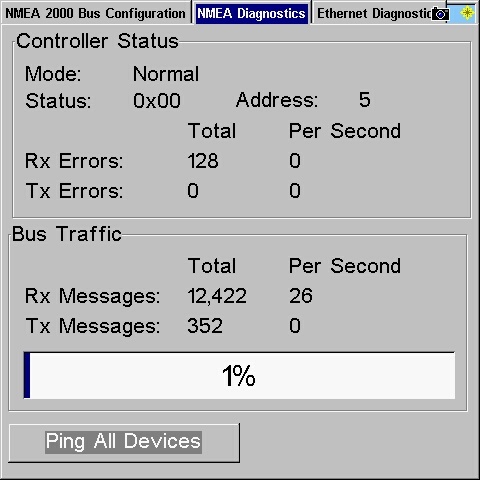 The NMEA-2000 port on the LMS-520c also includes this diagnostic screen to help analyze network operation and traffic. Lowrance makes several other NMEA-2000 devices which can be interfaced to the LMS-520c. There are fuel flow sensors, tank level sensors, temperature sensors, and speed sensors, and the data from these devices can be displayed on the LMS-520c in various ways. The primary limitation will probably be the screen area available. Lowrance also provides for display of data from other manufacturers' NMEA-2000 devices such as an Evinrude E-TEC engine controller. 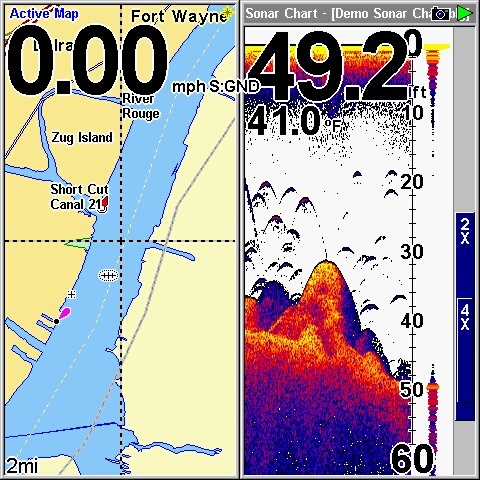 This allows the screen of the Lowrance GPSr-Chart Plotter-SONAR to become a multi-function display. 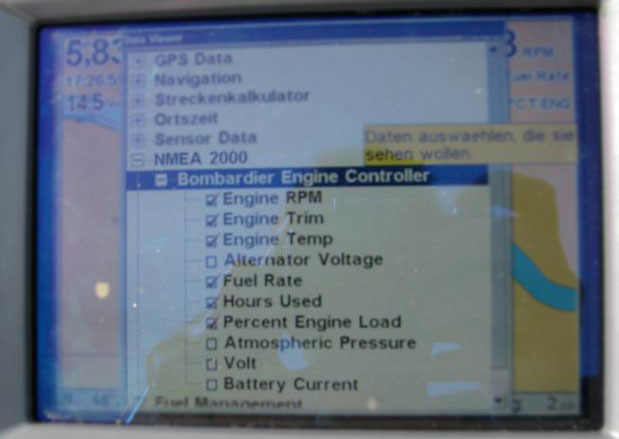 Engine data such as engine speed, engine temperature, alternator voltage, and other parameters may be chosen for display. To test the LMS-520c's NMEA-0183 connection, I interfaced it to my Apple PowerBook G4 using a Keyspan USB serial port adapter. Using the MacENC navigation program, I was able to monitor the data on the LMS-520's serial port which was coming from the LCG-3000 GPSr. How the electronic chart display will react to any NMEA-0183 sentences supplied on the input is not clearly explained in the manual or in the operating system. As more devices are added to the network, some of their data should also become available for on-screen display. The complete scope of this is not well documented in the Lowrance literature. 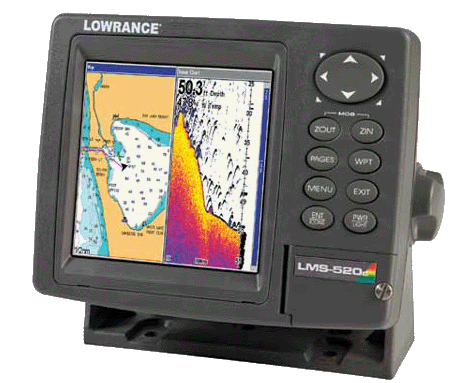 With the exception of more detailed cartography, Lowrance has included just about everything needed to use the LMS-520c. To make a direct comparison with the Raymarine A60, another device in this price range, we could add the same Navionics USA chart package for an additional $130. The LMS520c is currently selling at about $650. With the addition of the Navionics USA chart package, the price rises to about $780. Moving to a dual frequency model adds about $50, thus bringing the price to about $830. This puts the Lowrance LMS-520c about $170 below the price of the Raymarine A60 (reviewed previously). 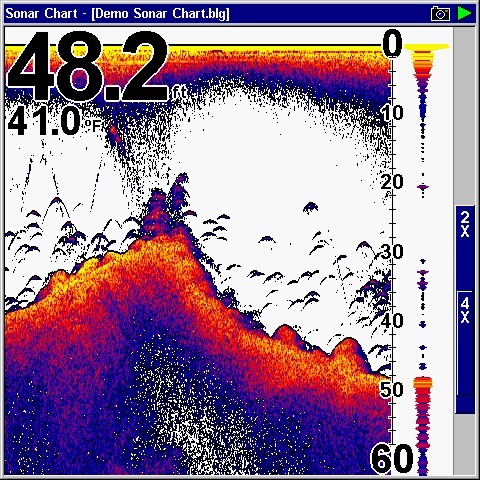 The Lowrance LMS-520c appears to be an excellent color SONAR married to a decent GPSr and a bright, detailed, fine resolution 5-inch color display. The NMEA-2000 networking feature is very innovative and will be of interest to boaters who have a motor (such as an Evinrude E-TEC or a Suzuki four-cycle) which has NMEA-2000 networking capabilities. Boats with those rigs will likely already have a NMEA-2000 networks in place. When the Lowrance LVR-880 VHF Marine Band radio with digital selective calling and MNEA-2000 networking becomes available, it will be simple to interface with the LMS-520c. Many thanks to Dave Zammitt at Lockeman's Boat and Hardware for providing the LMS-520c used in this evaluation. There is a thread with further discussion of the Lowrance LMS-520c in the SMALL BOAT ELECTRICAL discussion. Copyright © 2008 by James W. Hebert. Unauthorized reproduction prohibited! This article first appeared April 8, 2008.